At least this week we weren’t waiting around for games to be called off. After the rain started falling on Tuesday night it simply didn’t stop. Some clubs had made their decisions yesterday that there would be no football, and by 10am 90% of the games in the Ryman Premier League were lost once again to the weather. The situation is now getting beyond a joke, yet the League administrators are conspicuous by their continued silence. “Problem? There isn’t a problem here” they will be saying as fixtures start to pile up and clubs are forced into financial dire straits by the lack of home gate revenues. By 11am only two Non League games within the M25 had survived – one at Thamesmead Town where I had been a frequent visitors in recent months on scouting missions and one in unchartered territory at Barnet FC. No brainer where I would be heading then. 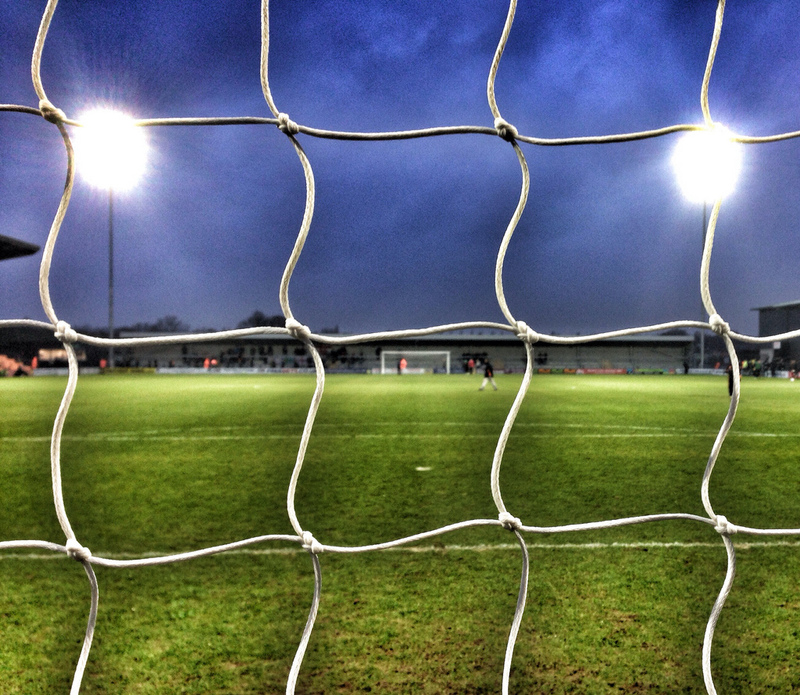 It almost seemed to calm to be true as I checked the Barnet website and Twitter feed – “pitch in immaculate condition” was the main message which did seem to defy the odds considering the chaos and mayhem playing out in front on my eyes on the iPad. I have always had a soft spot for the Bees and for one magical season back in 1991 I went to most games in the first Football League season at Underhill. I was romantically involved with a young lady who lived in Barnet, and to escape Saturday afternoon’s shopping in Brent Cross with her and her mother, I became a Barnet fan, managing to convert her father after their amazing Football League debut against Crewe Alexandra where they lost 7-4. The club was welcoming and rough around the edges, without any airs and graces. You had the feeling that the club, owned at the time by self-confessed ticket tout Stan Flashman and managed by the original wheeler-dealer Barry Fry, didn’t give a toss for the officialdom of the Football League. The Non-League spirit lived on at Underhill for many years despite changes in ownership, management and league status. But somehow in recent times it all changed. Perhaps it was simply that football itself changed and the Bees realised if you can’t beat them then you need to join them, or that people with different agendas got involved in the club. The long-term legal wranglings over the suitability of Underhill as a League ground were always the main topic of discussion when I met Barnet fans, rather than their league status. They still remain the only club that has been promoted twice from the Conference and relegated twice back down from where they came. This is not the forum to comment on what has gone on over the past couple of seasons with the club – I don’t have the in-depth knowledge or facts to make a sound judgement on whether the decision to move out of Barnet and the Borough was right or wrong, nor whether relegation from the Football League at the end of last season was justified. But I could review their new home and how they had settled into life in the Conference Premier…again. The Hive is the collective name for the complex that has been built in the Borough of Harrow. The original plans were for a 5,000 capacity stadium that would also be used by Wealdstone. However, somewhere along the way their name slipped off the invitation and so today the new ground is used solely by Barnet FC, although next month sees the London Broncos start their Super League season here. The journey to the ground was certainly straight forward – a 45 minutes, two episodes of Partridge, ride on the Jubilee Line to Canons Park, passing the stadium on the way before a 10 minute walk. The ground certainly looked smart. A very sizeable bar with TV’s everywhere showing the football and a club shop selling last season’s socks for £2 (TWO!) – two ticks in the plus column before the small hand had reached 2pm. Alas, it then went a bit wrong. Quite how the club can justify the pricing structure is beyond me. £17 to stand on the terrace was £2 more expensive than tickets at Ipswich Town today and £7 more than Watford down the road and Brighton & Hove Albion. If you wanted a seat then you could choose from a £20 uncovered one or £23 for a roof over your head. However, due to the incessant rain and strong wind, even those who paid the top price got wet in many parts. I’m sorry Barnet, but I cannot see how you can justify such high prices? Attendances this season are down by 700 on average and will certainly continue to fall if the pricing structure is retained for much longer. The club had taken a big gamble in recruiting Dutch international Edgar Davids in 2012 as player/coach and whilst he oversaw their demotion from the league, he is still at the helm, although after just the three red cards in the first few months of the season he vowed to hang up his boots and concentrating on the management of the side. And so far, so good as the Bees sat just outside the play-off zone prior to the visit of Alfreton Town, themselves enjoying life at the top end of the Conference Premier. Admission paid (£17), Bovril in hand (£1.50), Snickers in pocket (£2) and new socks on (£2) I prepared for a rare event – a Non-League game actually being played. On my tube journey home I wrote my match summary – it read like this….”Rain, Bovril, Snickers, Goal for Barnet, Tube trains, Full Time”. There really wasn’t much else I could really add. This wont be a game that will live in the memory for long. In the first half I managed to work out that a tube train passed the ground (in either direction) every 94 seconds – that was how exciting the game was. Neither team seemed to want to hold onto the ball for more than a few seconds, with the ball boys being the busiest people in the ground. Alfreton’s direct style wasn’t winning them any fans from Barnet, and didn’t trouble Jupp in the Bees goal at all in the first 45 minutes. As we were all engrossed in our programmes, Twitter feeds or in my case another Bovril, Dani Lopez picked the ball up thirty yards out and fired an unstoppable shot into the net via the underside of the bar. It was a goal so out of character with the game that we had to pinch ourselves. The referee was so surprised that he added two extra minutes for no particular reason. The second half couldn’t get any worse, and thankfully it wasn’t. 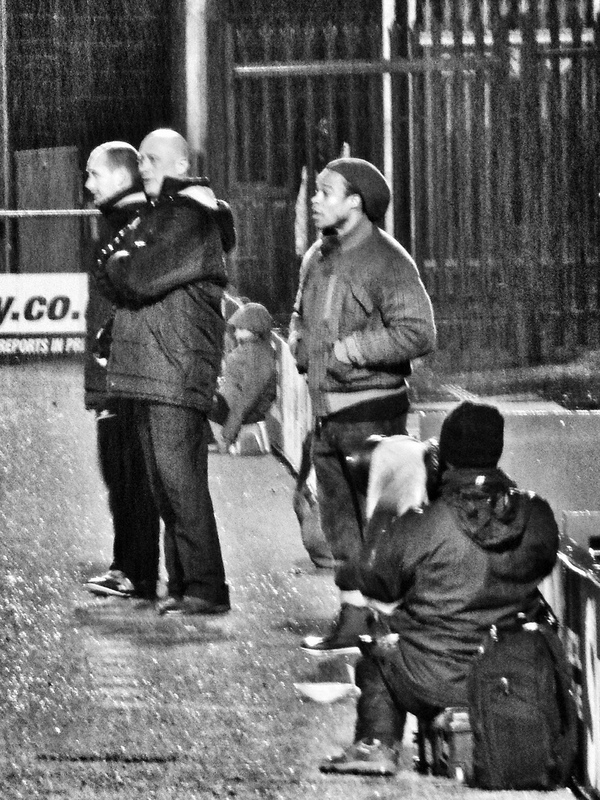 The rain got harder and Barnet started to use the pace of the surface to get behind the Alfreton defence. Hyde should have scored when he was clean through on goal but lifted his shot over the Alfreton keeper but saw the ball drift wide. Davids was certainly a much calmer person as a coach rather than a player and he refrained from making any changes, confident that the Bees would see out the game. However, it seemed like the referee forgot to start his watch at the beginning of the half as we were still playing in the 99th minute of the game despite no serious injuries, no bookings and just the one goal. Perhaps he wanted us to get our monies worth? Finally the full time whistle brought relief to the home fans and three welcome, and deserved, points. Alfreton had missed the opportunity to pull level on points with second place Cambridge United and their noisy fans would look back on the game as one where the players didn’t really turn up. My verdict on London’s newest stadium? Smart, perfectly functional ground for a club in Barnet’s position but way overpriced for the facilities in the stadium. Whatever the politics are behind the club, you hope that one day both sides can see that the only way to go up is to work together. This entry was posted in Non league football and tagged Alfreton Town, Barnet, Conference Premier, The Hive. Bookmark the permalink. 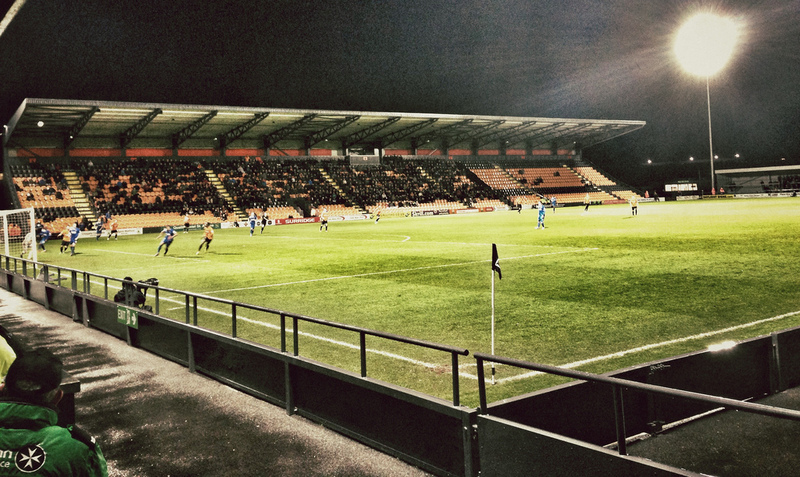 I think you and I were among several fans who went to The Hive as a fall-back option on Saturday. It must also be a concern for those clubs already facing fixture pile-up that we haven’t even had any snow yet!